WASHINGTON — Dozens of senior White House officials could soon lose access to classified information under new policies ordered by White House Chief of Staff John Kelly, according to documents reviewed by NBC News. Kelly outlined an overhaul of the processing of security clearances in a memorandum Friday following two weeks of controversy over why former staff secretary Rob Porter had access to the nation’s most sensitive information despite red flags raised during an FBI investigation. Among the most significant changes would be to discontinue any interim clearances for staff in the Executive Office of the President whose permanent clearance requests have been pending since June 1, 2017. NBC News earlier reported that more than 130 staff in the White House and other agencies closely associated with it were operating on some form of an interim clearance as of last November, including a dozen of the president’s most senior aides. Documents obtained by NBC News indicated that, as of November 2017, at least 48 officials who started work at the White House prior to June 1 had an interim SCI clearance. SCI, or sensitive compartmented information, is classified material that gets more detailed than top secret information and can include sources and methods. That list includes Jared Kushner, the president’s son-in-law and senior adviser; Ivanka Trump, the president's daughter and senior adviser; and even White House counsel Don McGahn, who is one of the three officials to whom Kelly’s memo is addressed. Another eight officials lacked permanent clearance to view information at the top secret level. Since NBC News first published the story Wednesday, the White House said several officials have since attained permanent clearances of varying levels. The new policy would also likely impact many of the 74 other officials listed in the documents as operating on interim security clearances. Kelly also said he would limit access to certain highly classified information for those with interim clearances absent his explicit approval, granting access “only in the most compelling circumstances.” Now, any future approved interim clearances would be valid for only 180 days, with an option to extend another 90 days if “no significant derogatory information” was revealed during a background investigation. Kushner attorney Abbe Lowell said in a statement that delays in this clearance process are not uncommon, and that “no concerns” have been raised about Kushner’s application. “The new policy announced by General Kelly will not affect Mr. Kushner's ability to continue to do the very important work he has been assigned by the president,” he said. Going forward, Kelly also seeks to formalize the process by which the FBI would notify the White House of negative information raised during a security clearance background investigation, and reduce the lag time for conveying that information to the White House. 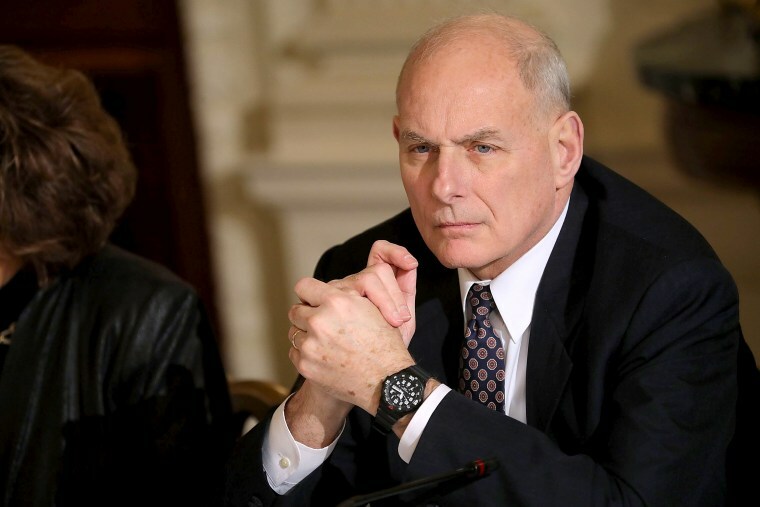 Any derogatory information uncovered during background checks involving the highest-level White House officials — so called commissioned officers — should be hand-delivered to the White House counsel, Kelly directed. Kelly’s memo reveals changes he made involving security clearances shortly after he became chief of staff last July. He says he ended the practice of granting new interim clearances last September, “absent extraordinary circumstances and my explicit approval. More recently Kelly says he reduced the overall number of officials with security clearances, or adjusted the level of their clearance to correspond with the official’s job duties.